Let’s say you were standing outside the Dakota apartment building at one 72nd Street New York, New York. Walk across the street to Central Park. Take in the scenery as you walk through the infamous Strawberry Fields. Passing pristine knolls and playing fields, making your way towards the Central Park Zoo. Once the path to the zoo takes you beyond the wild beasts you will reach the park’s eastern edge. Here lies the old New York Arsenal at 64th street. Walk a block south to 63rd street. Follow 63rd until you are between Park Ave and Lexington Ave. Stop when you reach the red awning! You have arrived at your destination. Welcome to the Society of Illustrators. I have brought you here because hidden away is a splendor of pencils and inks of pure gothic horror. 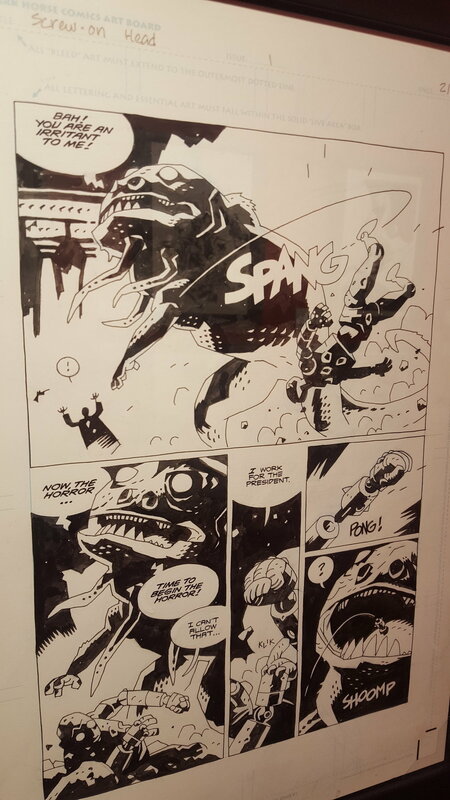 Hung respectively in a long red hallway is original artwork by the prolific Mike Mignola. If you are unaware at this point who Mike Mignola is, then let’s discuss. He is most famous for creating the character Hellboy, and the larger universe of characters he occupies. Before creating Hellboy he cut his teeth in both Marvel and DC Comics working on various covers, one shots and mini-series. With Marvel, some of his work included the original Rocket Raccoon 4 issue mini-series and the Wolverine: The Jungle Adventure. To name a few projects at DC, he worked on Batman: Gotham by Gaslight and World of Krypton with writer John Byrne. Then in 1993, coming to life in the pages of John Byrne’s Next Men, Hellboy was born. Writing and penciling the majority of Hellboy’s stories, Mike became a household name in the comics industry and in the collections of people everywhere. 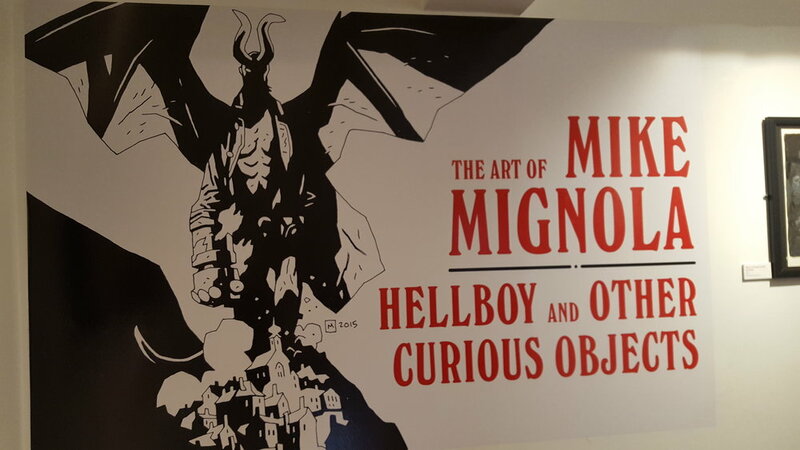 The Society was holding a special exhibit titled The Art of Mike Mignola: Hellboy and Other Curious Objects. Encompassed on the second floor were pages and covers by Mike. 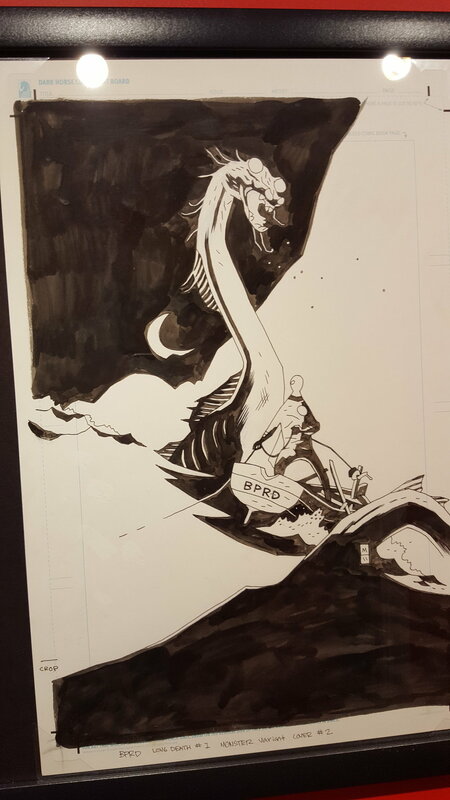 The artwork was from various Hellboy titles such as “Hellboy”, “BPRD”, “Abe Sapian” etc etc. Hung in black frames in a red hallway. A fitting presentation for big red himself. The lights heated the narrow hallway. You felt like you were in a carnival version of hell. Perusing I found large splash pages from the likes of Hellboy in Hell and BPRD. Seeing original artwork always fascinates me. The original artwork, if you didn’t know, is larger than a comic book. I understand now with computers you can shrink the original artwork down to the size of a comic book. It just takes a little scanning. I always wondered how they managed to do it before the computer age. Pre-computer comic book publishing compared to post- computer publishing could easily be another article. Walking down the corridor, to the left and right of you we find covers and panels. Not every piece of artwork was just inked, there were also a few beautifully painted watercolors. Mike Mignola’s art has always fascinated me. Mignola uses shadow to create space, the highly stylized shapes create stark images. Famed comic book writer Alan Moore has gone on to describe Mignola’s style as “German Expressionism meets Jack Kirby”. German Expressionism can be summed up as distorting the world radically for emotional effect, in a manner to evoke moods or ideas. Hellboy and other Hellboy universe stories often use elements from religion, the occult, science fiction and conspiracy theory to paint a reality where devils walk the earth. The highlighted artist’s style illustrates these themes with every line and shadow. I see much emotion in Mike Mignola’s artwork due to the heavy contrast of light, shadow and theme. When you look closer at each piece you realize that the inks aren’t as striking as they look in the finished product. There is an unevenness to them. Almost as if the ink was thinly applied. White of the paper comes through in strokes. You can tell they have been inked by brush. I assume after artwork is scanned the grayscale is touched up. There must have been close to 30 pieces, 40 tops. All ranging from 2002 to 2017. Unfortunately, there weren’t any panels from seminal stories such as Seed of Destruction, Wake the Devil and Conqueror Worm. Besides the Hellboy universe we also saw pages from the likes of Baltimore, Sandman, Witchfinder and other stories. This exhibit ran for a month. I was personally waiting for this show to arrive and because of a busy schedule, it almost slipped by me. I saw it on its last day. 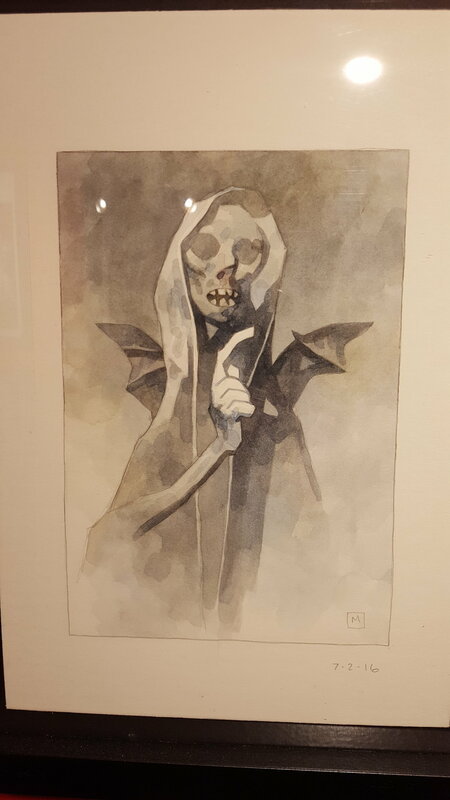 While I was there a college professor took his class to appreciate Mr. Mignola’s artwork. We were all crammed in that narrow space for one reason. To appreciate a living legend. A man with style not shared by anyone else. Celebrating over 30 years in the comic’s industry.